This industry is full of corrupt providers and scammers but most Accountants & Financial Advisors operate with a high level of ethics, professionalism, due care and responsibility largely because they are tightly regulated in most Markets. Sadly last week Secure Platform Funding was contacted by Mr Ali Haji aka Haji Ali Ambaro (email: j4sixty3@yahoo.com) who turned out to be one of the most Corrupt Accountants & Financial Advisors we have ever dealt with! 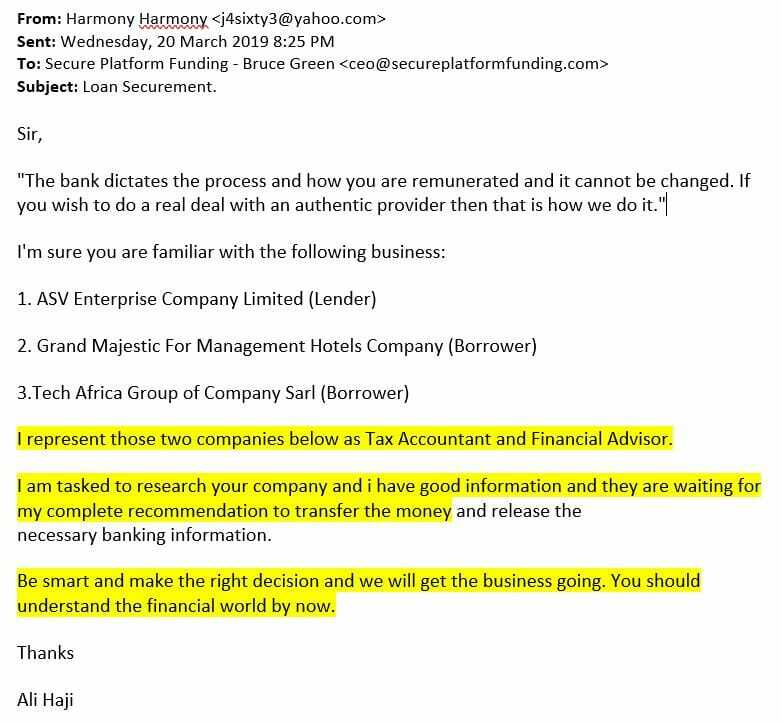 Mr Ali Haji aka Haji Ali Ambaro (j4sixty3@yahoo.com) contacted Secure Platform Funding as the Accountant and Financial Advisor representing: ASV Enterprise Company Limited, Grand Majestic For Management Hotels Company & Tech Africa Group of Company Sarl. Most Accountants & Financial advisors are paid by their clients so they take their responsibility to consistently act in their client best interests at all times very seriously. However Mr Ali Haji aka Haji Ali Ambaro (email: j4sixty3@yahoo.com) made it abundantly clear to us that he really didn't care about his clients! In fact Mr Ali Haji aka Haji Ali Ambaro's primary focus was to secretly steal as much of his own clients deposit as possible. 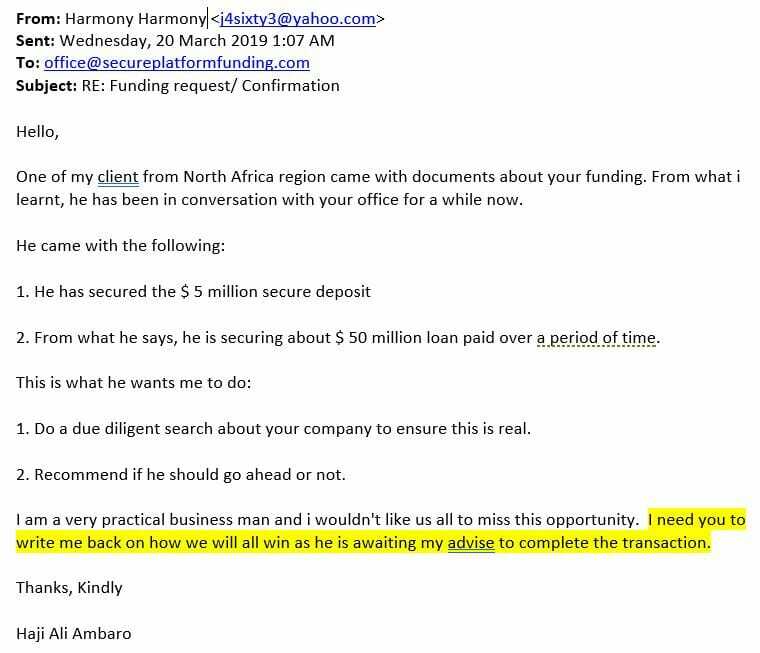 Ali Haji aka Haji Ali Ambaro (email: j4sixty3@yahoo.com) was only interested in one thing..... MONEY! We could buy his recommendation if we paid him enough MONEY! And if we didn't pay him enough MONEY then we would NOT recommend Secure Platform Funding and we would lose the business completely. And he wanted his payments to be deducted from HIS OWN CLIENTS DEPOSIT FUNDS! Mr Ali Haji aka Haji Ali Ambaro (email: j4sixty3@yahoo.com) was morally bankrupt, he was just out to make himself a ton of money and he was happy to extort us and abuse his clients trust to achieve his goal. Secure Platform Fundings integrity isn't for sale! We will NOT compromise our ethics, business principals and professionalism for a few pieces of silver. We are NOT corrupted by Greed and you CAN NOT buy our Loyalty! We will NOT sell our Soul to the Devil EVER! 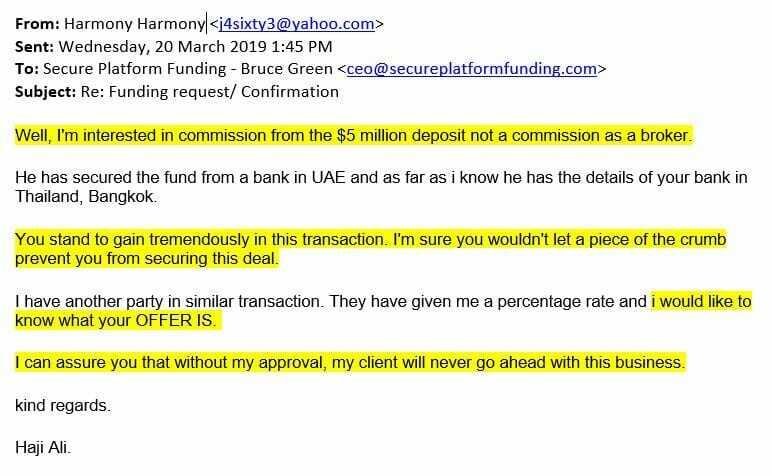 Below are copies of the correspondence Secure Platform Funding exchanged with Mr Ali Haji aka Haji Ali Ambaro (email: j4sixty3@yahoo.com) were we consistently told him we would not allow our process to be corrupted by him or be seduced by his offers. We would not allow him to be financially rewarded for betraying his clients trust and operating in a devious, illegal and unethical manner. Too many people in this business like Mr Ali Haji aka Haji Ali Ambaro (email: j4sixty3@yahoo.com) are corrupted by greed and have forgotten to treat others with honesty, respect and integrity as they themselves would like to be treated. Secure Platform Funding doesn't chase money, or deals or people. Our desire is to do authentic transactions with authentic people and complete them in an professional ethical way so that clients want to return and do repeat with us business over and over again. The values of our business are not for sale! We value our integrity more than we value money. That's why our website www.SecurePlatformFunding.com is so brutally honest, exposes and names so many scammers and tries to educate and warn customers with quality information. Here is our record of Secure Platform Fundings correspondence with The Corrupt Advisor. We emailed full details of our Managed SBLC Program which clients use for funding businesses, projects and real estate. "We pay commission based on the broker level you are registered on here: https://www.secureplatformfunding.com/brokers/"
"Sir, The bank dictates the process and how you are remunerated and it cannot be changed. If you wish to do a real deal with an authentic provider then that is how we do it." "Sir, Sorry our integrity isn't for sale!" "Sir, We will be exposing your corruption. All the best"
WARNING: If Mr Ali Haji aka Haji Ali Ambaro is your Accountant or Financial Advisor you might be wise to find someone else! He proven is is very happy to operate with a conflict of interest and try and maximize his own personal wealth while he sells out his own clients down the river and fails to honor his fiduciary duties as an Accountant and Financial Advisor.